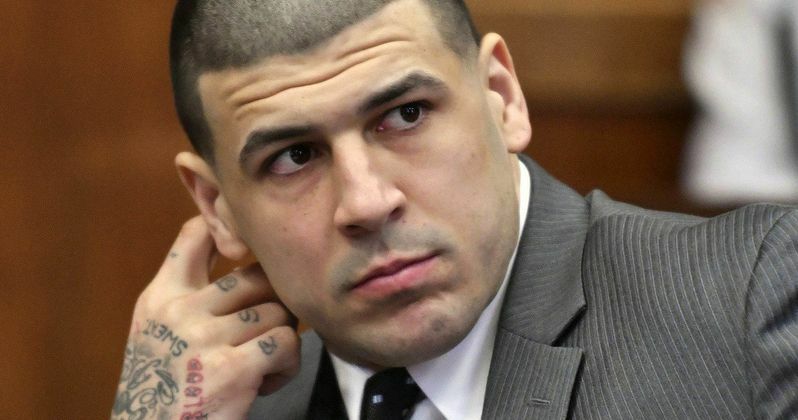 The Mark Gordon Company has acquired the rights to the upcoming book All-American Murder: The Rise and Fall of Aaron Hernandez, the Superstar Whose Life Ended on Murderer's Row, written by New York Times' bestselling author James Patterson and Alex Abramovich, with Mike Harvkey. The true crime book, which delves into the Aaron Hernandez murder case, will be published on January 22, 2018 by Little Brown and Company, with Mark Gordon producing the adaptation alongside Matt Jackson, Bill Robinson and Leopoldo Gout. Here's what producer Mark Gordon had to say in announcing the deal today. "The real, shocking events that led to Aaron Hernandez's harrowing fall from NFL stardom gripped America's attention and imprinted itself on today's cultural zeitgeist. James is unmatched in his storytelling and reporting talents, and he chronicles this story with incredible insight and nuance. There is no other person with whom to collaborate to bring this timely film to life." Aaron Hernandez was a star in the NFL, playing tight end for the New England Patriots, whose life was upended when he became the prime suspect in a gruesome murder. The book features in-depth, on-the-ground investigative reporting that gives readers a front row seat to Hernandez's tumultuous downward spiral. All-American Murder will reveal the unvarnished truth behind the troubled star, with first-person accounts and untold stories, from his hometown of Bristol, CT to his college days in Gainesville, FL to the Patriots' NFL locker room where he ascended to stardom, to the prison where Hernandez spent his final days. Packed with the shocking details of a true crime masterpiece and the pacing of a suspenseful thriller, All-American Murder answers the questions that everyone is asking about Aaron Hernandez. In 2013, Aaron Hernandez was arrested and charged with the murder of Odin Lloyd, a semi-professional football player who was dating the sister of Hernandez's fiancee. During the trial for Lloyd's murder, Hernandez was also indicted for the 2012 double-murder of Daniel de Abreu and Safiro Furtado. Hernandez was found guilty of first-degree murder in the Odin Lloyd trial, where he was sentenced to life in prison without the possibility of parole at the Souza-Baranowski Correctional Center. Last April, he was found not guilty in the double-murder case, but just days after he was acquitted, Aaron Hernandez took his own life in his jail cell, at just 27 years of age. No screenwriter or director is attached to this adaptation as of yet, and the project does not yet have a studio home, so it could be quite some time before this project is ready to go before cameras. This project comes just months after James Patterson joined forces with Showtime to adapt his upcoming thriller novel The President Is Missing as a TV series, which the author co-wrote with former U.S. President Bill Clinton. Deadline broke the news on this All-American Murder movie earlier today.